>This post is actually a testing post today from my new Apple Computer… MacBook. This will be the very first time I’ve ever used an Apple Computer! I was supposed to go shoot sporting clays this morning, but ended up finding myself at the local Best Buy getting a new home computer so that I can write blog posts…Karen and her girls keep telling me that I’m a computer hog at home! I dread this time of year…I love to ski and bike and fly fish, but I’d much rather be in the woods or prairies chasing wild birds with my bird dogs! So I’ve decided to try and be more productive and write some veterinary articles for bird dog magazines and work on a new website for my new LLC…hence the new MacBook. 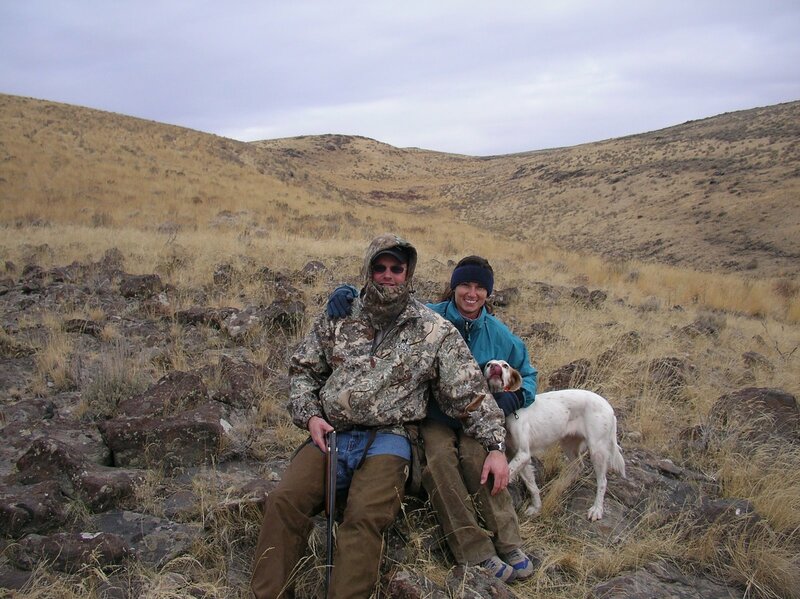 This picture is from a great memory I have of my two favorite girls…Ginny Girl and my girlfriend Karen…in Idaho chukar country! Ginny Girl had 30 plus points that glorious day! Previous Post THE WHITE WONDER: "SNIFF IT UP BOYS!" Next Post THE WHITE WONDER: "WANT TO TRADE DOGS?" >October is how far away again?